I could not have imagined my toddler on a scooter. I consider myself the parent of a ‘still-developing-good-gross-motor-skills’ child. Yes, she is great with using a spoon, opening cupboards that she is not allowed into and finding ways to reach things that are not meant for her on tables. But jumping, rolling around, riding on a scooter? Nah, I would have told you. She’s not that kind of child…or she’s just not ready yet. But the fact that you are reading this article probably indicates that you have a toddler with considerably better gross motor skills than mine. But the thing is, there are some scooters that are designed to make it easier for toddlers than others. We may all have different definitions of how old a toddler is but for the purposes of this article, I consider a toddler as being between the age of 1 year to 3 years old. Why Get A Scooter – Is it Worth the Investment? There are many things that you can buy for your child. Is a scooter worth the investment? I guess it depends on whether you think that your toddler will benefit from it. A scooter is a fun way to get around. Do you remember how much fun it was to be on your first set of wheels? Maybe it was roller skates? Skateboard? Or your first car? Interest in exercise and outdoor activity. Playing on a scooter is also great for kids with ADHD as it helps them to release pent-up energy doing something fun and constructive. At the end of the day, if there is a way to get your toddler out of the house away from the TV and to get involved in some healthy exercise, isn’t that alone worth the investment? We think so. How Do I Know That My kid is Ready for A Scooter? Ability to walk and run with sufficient balance and stability. Sufficient wrist, hand, and arms control and strength. Emotional maturity to listen to your instructions and follow your safety rules. Okay, so you think that your toddler is ready for a scooter. But how do you actually help him or her to get started? First, find a big level empty space to move around in without frequently bumping into things. If you have a scooter of your own, you could demonstrate how to use it or if there is an older or more experienced child around, get him or her to demonstrate. kids learn by watching and copying. Next, get your toddler to put one leg on the scooter board and leave the other leg on the ground. Then grasp the handles firmly. Ask your kid to transfer his or her body weight to the leg on the board and then push off with the other leg that is on the ground. It may take a few tries but the most important thing is that your toddler enjoys the experience of playing with the scooter and does not feel pressured. When your toddler gets the hang of it, he or she can then graduate to turning and other stunts such as putting both feet on the board and cruising! Here is a YouTube video that shows a kid successfully using a scooter for the first time. Scooter with 3 wheels (2 wheels in front and 1 one at the back) with handles that turn in the direction that the handlebar is turned. Scooter with 3 wheels (2 wheels in front and 1 one at the back) that requires leaning-to-one-side for turning and the handle itself does not turn. Scooter with 3 wheels (1 in the front and 2 at the back). Unless your toddler is particularly physically advanced in his or her development (or this is not his or her first scooter), we would suggest that your toddler should stick to a scooter with 3 wheels, not 2. Also, it will be a lot easier for your toddler to start off with a scooter with 2 wheels at the front and 1 wheel at the back. This makes standing on the scooter easier. A key decision you will have to make is whether you want a ‘lean-to-turn’ steering style or a ‘direction-turn’ steering style. A ‘lean-to-turn’ steering style requires your toddler to lean in the direction that he or she wants to go. This is great training for learning to ride a bike later on. The problem though is that if your toddler doesn’t have great balance on a moving board yet, he or she may struggle with getting that leaning balance just right so that it doesn’t tip over. The benefit of a ‘direction-turn’ steering style is that your toddler doesn’t have to do any leaning to make the scooter turn. Instead, your toddler just turns the handle in the direction that he or she wants to go. This makes this suitable for toddlers that can’t balance very well on a moving board but just want to be able to move around on the scooter. The downside of this ‘direction-turn’ steering is that once your toddler gets the hang of the scooter, he or she probably will find it harder to go fast with the ‘direction-turning’ steering style. The handlebar should be lower than your toddler’s neck. This is to ensure that your toddler doesn’t get smacked in the face in an untoward event. 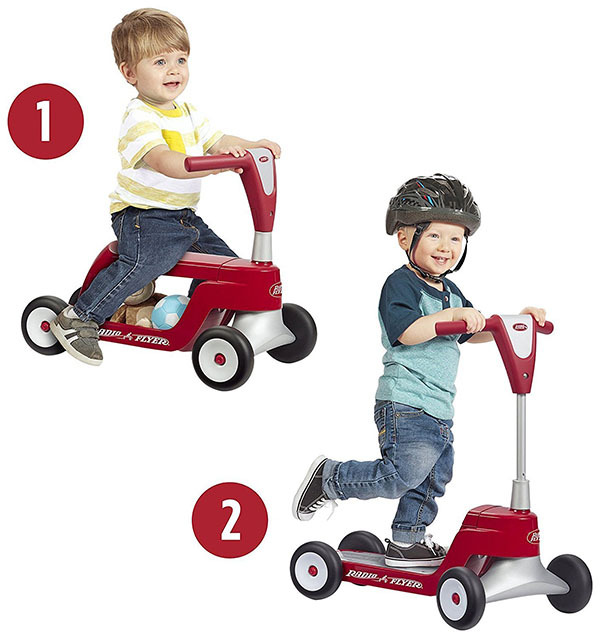 If your toddler is closer to 1 year old in age or not very physically advanced, you may want to consider a scooter that can also be used sitting and that later converts to a standing position. Some scooters come with an ‘O bar’ which is a handle with a circle that makes it easier to grip for shorter toddlers. And last but not least, you should coerce your toddler to wear a safety helmet and if possible, invest in some knee pads and elbow pads too. Why not reduce the likelihood of painful scratches, right? This is a near-perfect scooter for young toddlers. 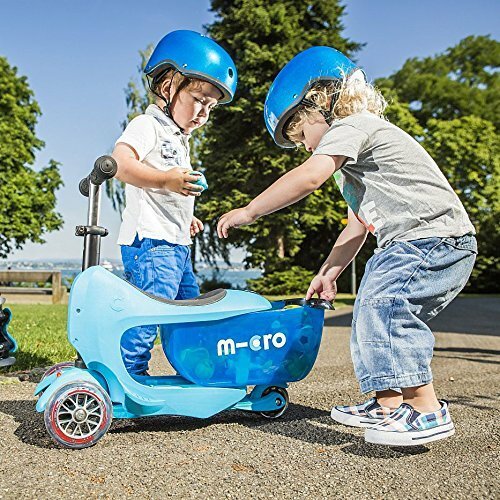 The recommended start-off age for the Mini 3in1 Scooter is 1 year! For toddlers who are using a scooter for the first time and are not ready yet to stand on a moving board, the Mini 3in1 Scooter comes with a seat that takes up to a maximum weight of 44 pounds. 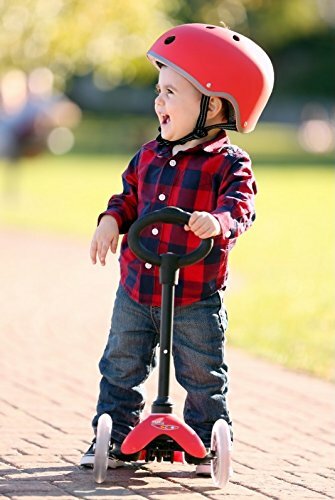 Once your toddler feels a little more confident to stand on the board, you can remove the seat and convert it into a standing scooter with an ‘O bar’ which is a bar with a rounded handle shaped like a circle for a better grip. Do note that the ‘O bar’ itself is not adjustable for height. When your toddler is confident enough to balance on the scooter, you can swap out the “O bar’ into a “T bar” which is the T shape that you normally see on scooters. This ‘T bar’ can be adjusted to a height of 17 to 25 inches and the scooter will take up to 75 pounds of weight when in a standing position. The steering is a lean-to-turn type which means that your toddler needs to use his or her weight to lean to one side to turn the scooter. This scooter comes in 3 color options; red, blue and a pink/black combo. The handlebar is also removable for easy transportation. The Mini 2-Go Deluxe Scooter is similar to the Mini 3in1 Deluxe Kick Scooter above but with some differences. This scooter is for young toddlers who are aged approximately 18 months and above. Like the Mini 3in1, your kid can start off sitting on the scooter. However, this seat is a little bit wider and there is a cool storage space for toys underneath. The seat takes up to 30 pounds of weight. Once your toddler feels more stable and confident, you can remove the seat and storage container to convert it into a standing scooter. The standing scooter takes a maximum of 75 pounds of weight. The handlebar adjusts between 14 to 24 inches of height, which is slightly interesting since it actually goes lower than the Mini 3in1. This scooter comes in a choice of 4 colors; blue, mint (green), pink and red. Although not the cheapest, this scooter can easily grow with your toddler. 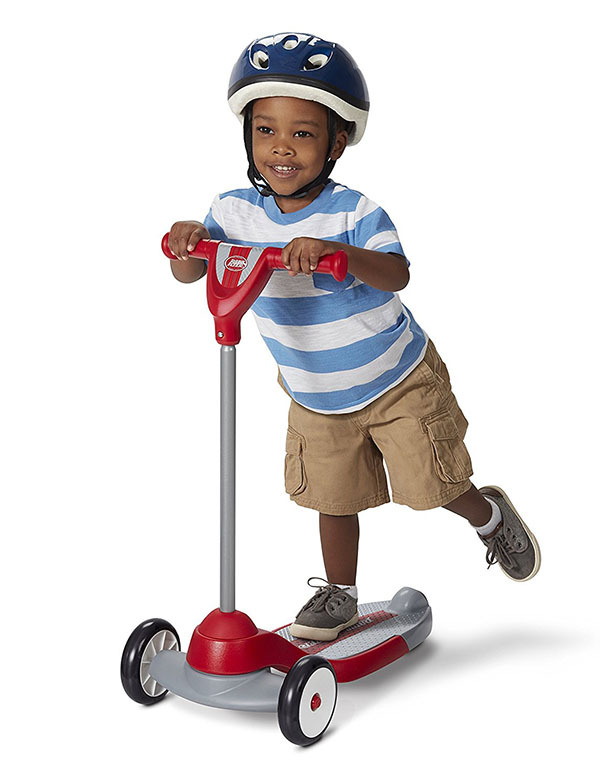 This is another great starting scooter for young toddlers. Unlike most of the scooters mentioned in this, this scooter has 4 wheels, not just 3! This makes the scooter a lot more stable. This scooter converts from a sitting position to a standing position too. The handlebar is adjustable between the height of 17 to 23 inches. It takes a maximum weight of 44 pounds in a sitting position and 75 pounds when standing. What also makes this Scooter special is that this scooter uses the simple ‘T bar’ direction-turn steering style. There is also storage space beneath the seat for toys to be kept. One criticism of this scooter is that it has a lot of plastic, unlike some of the other brands that have more aluminum in its design. 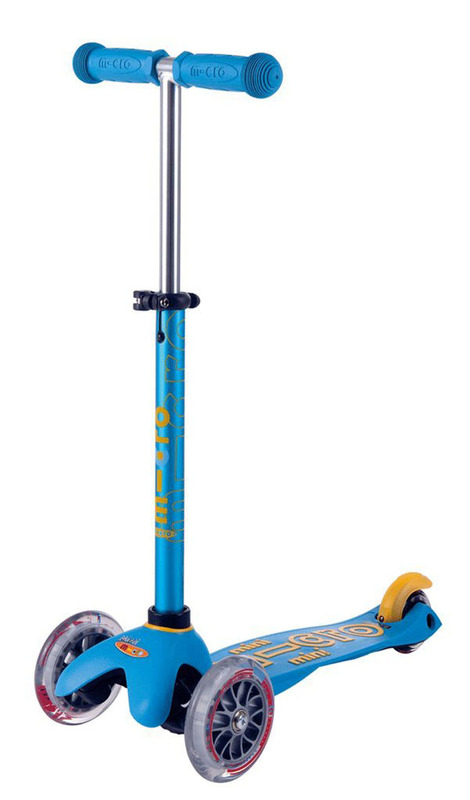 Still, this scooter comes at a great price and is great for younger or smaller toddlers. This Radio Flyer is officially recommended for kids between the age of 2 to 5 years. It also comes with 4 wheels, not 3. 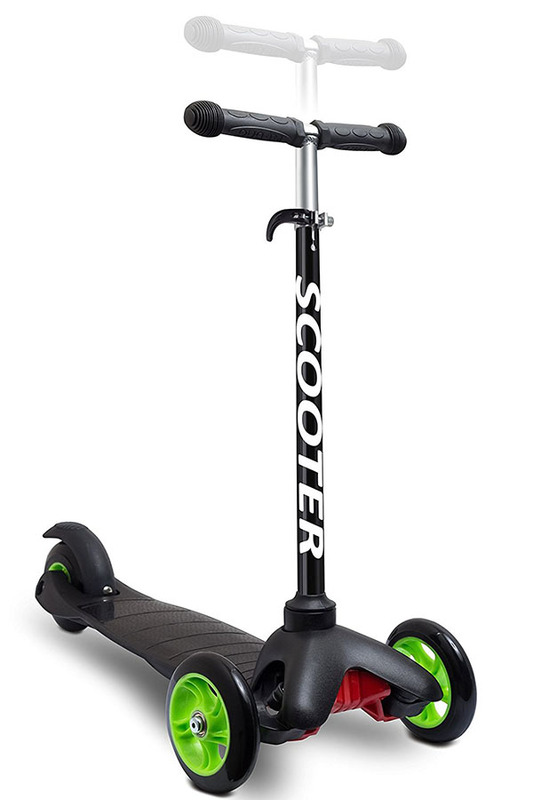 Unlike some other scooters, the height of this scooter is not adjustable and it takes a maximum weight of 50 pounds. The steering style is direction-turn so depending on how you see things, you may or may not like this. It comes in 2 designs of mainly red, white and gray colors. This is a straightforward, sturdy and cost-effective scooter. This is a pretty basic but reliable scooter. There is no official manufacturer’s recommended age provided but we estimate it to be suitable for toddlers between 2 to 5 years old. The ‘T bar’ is adjustable for the height of 14.5 to 24 inches and this scooter can carry about 80 pounds of weight. The steering also uses a lean-to-turn style and it comes in 2 colors; pink or black. It isn’t as fancy as some of the other scooters but it comes at an exceptionally great price. 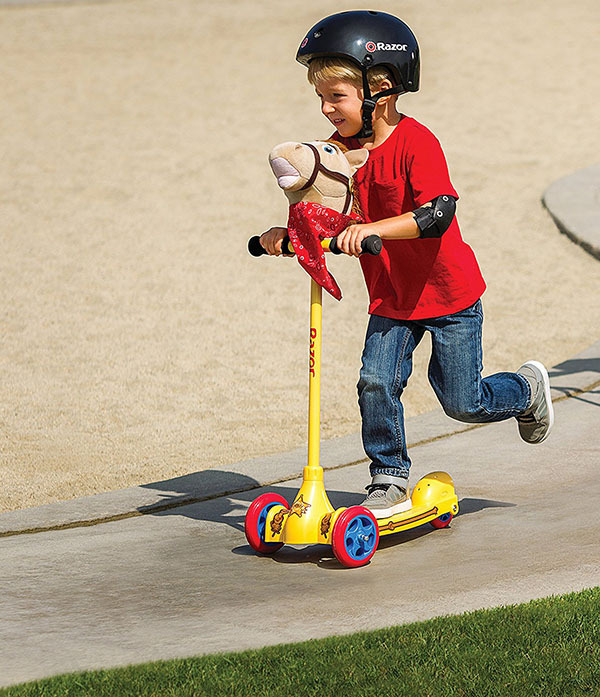 The Mini Deluxe Kick Scooter is suitable for older toddlers. The ‘T bar’ can be adjusted to a height of 17 to 25 inches and it can take 75 pounds like the Micro Kickboard Mini 3in1. However, this scooter doesn’t allow for sitting and this is reflected in the cheaper price tag. This scooter does come in 11 different choices of colors and it also uses the lean-to-turn steering design. The ‘T bar’ is removable for easier transportation. Razor is a well-known scooter brand and has been around for a while. This scooter takes a maximum weight of 45 pounds but what makes this scooter special is that it comes with a removable horse head and stick so that it doubles up for make-believe horse-riding fun. The steering is also a lean-to-turn. Although it only comes with predetermined colors, they are bright and eye-catching. There is also a pink unicorn version if your child is more inclined that way. These are the best scooters for toddlers in our opinion. We hope you find one that suits your toddler.